Everyone makes list. Shopping lists. New Year’s resolutions. Priorities. 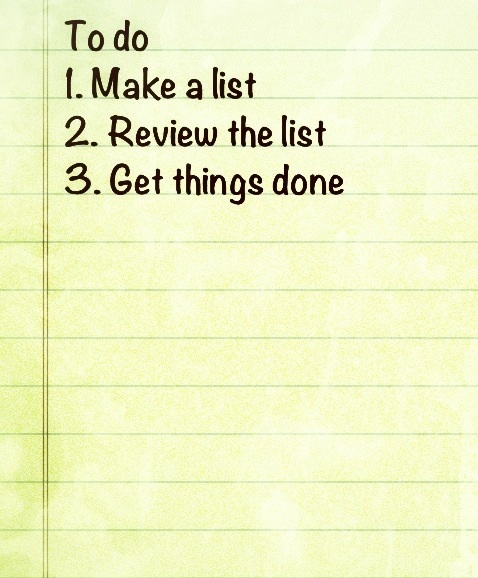 Lists are a powerful tool for getting things done and I confess that I have always been a bit of an obsessive list maker. I have to do lists, not to do lists, and tracking lists. I have so many lists I sometimes feel like I should make lists to track my lists. I admit I have a bad memory and I am not one of the blessed people who are able to store everything important in their heads (or at least I haven’t yet mastered that skill). Besides all of this, even tiny check marks on my list put a smile on my face and give me a dose of accomplishment. When we write things down, it helps us visualize a desired outcome along with any steps required to get there. The decision to act and the visualization process are critically important, particularly for large and potentially overwhelming goals. Written goals are also more likely to be etched in our minds, so if we set goals, or make plans, we are more likely to reach them simply because they are top of mind. Lists are also good for tracking things. Sports for instance. I like to record all my workouts in a log partly so I can remember what I did yesterday or last week, and partly so I can see how my workouts and energy levels progress over time. There is a reason why successful businesses publish goals. Documenting targets puts a stake in the ground, gets people to focus their collective energies on specific outcomes and provides a benchmark to measure progress. The same rules apply to us personally when we want to achieve any goal or effect change in our lives. We are more likely to stay focussed, hold ourselves accountable and get to where we want to be. Posted on: January 3, 2013 Comments: 0 Comments - Leave a comment!